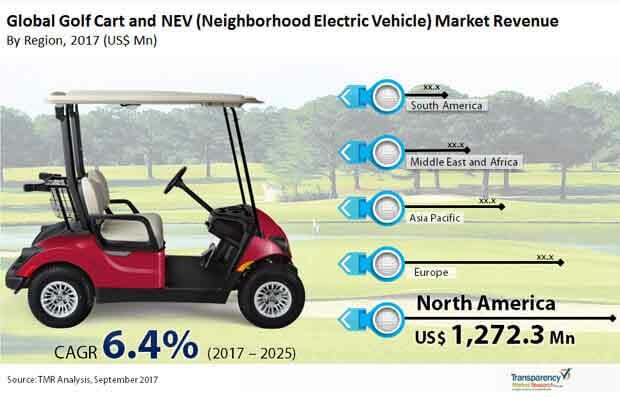 The largely consolidated vendor landscape of the global golf cart and neighborhood electric vehicle (NEV) market features a high degree of competitive rivalry among top players, reports Transparency Market Research (TMR) in a new market study. In 2013, the key four companies, namely Textron Inc., Polaris Industries, Yamaha Golf Cart Company, and Ingersoll Rand Corp. held a share of 70% in the overall market. Savvy players in this market are investing in research and development for innovative products that will help them outshine their competitors. Apart from this, leading companies are focused to formulate new marketing strategies and advertising campaigns that will help increase their customer base. The global golf cart and NEV market is projected to rise at a CAGR of 6.4% between 2017 and 2025, for the market to reach a valuation of US$3,819.2 mn by the end of 2025. By engine, electric powered engine held the leading revenue in the global golf cart and neighborhood electric vehicle market in 2016. Low maintenance cost of electric powered golf carts and government initiatives to reduce pollution are benefitting the electric powered engine segment. Golf carts held the leading revenue over neighborhood electric vehicles on the basis of type in 2016. Geography-wise, North America dominated the golf cart and NEV market in 2016 accounting for the leading revenue share amongst all regional segments. Among the key growth of global golf cart and NEV market, the rising demand for pollution-free vehicles that are sustainable in the long run is a prominent one. This is having a positive bearing on the demand for electric vehicles, which include golf carts and neighborhood electric vehicles as well. Electric vehicles have advantages of being energy efficient and environment friendly over gas powered vehicles and can cover small distances at low speed. Apart from this, electric vehicles provide smooth performance and require less maintenance than what is needed for traditional internal combustion engine vehicles. The market is also expected to benefit from technological advancements in golf carts and NEVs in developed and developing countries such as the U.S., the U.K., Germany, China, France, and Japan. In developing economies, rising disposable incomes leading to increased spending on bulky electrical appliances such as refrigerators, air-conditioners, and music systems is leading to an increasing demand for NEVs for delivery purposes. Further, widened application areas of NEVs such as in tourism and town commute are bolstering the growth of global golf cart and NEV market. The growth of the golf cart and NEV market is also driven by the demand for golf cart and NEV in golf courses, security patrols, small campuses, and travel over short distances, parks, and hotels. Moreover, the swift shift from gas powered golf carts to electric powered golf carts is anticipated to emerge as a key trend in the global golf cart and NEV market. On the downside, the high initial cost of golf carts and NEVs is slowing their adoption. Golf carts and NEVs are technically complex that require delicate handling. Further, the recent economic depression in North America which is a leading consumer of golf carts and NEVs is slowing the sales of golf carts and NEVs. Lack of infrastructure for charging points for golf carts and NEVs in developing countries is further hindering the market’s growth. Nevertheless, initiatives undertaken by leading companies to develop novel golf carts and NEVs with longer battery runtime is expected to favor the market’s growth. Other factors acting in favor of the market are initiatives from manufacturers for developing higher efficiency and less expensive electric vehicles.